Mobil Steel International, Inc.’s experienced and talented team guides you every step of the way through your steel fabrication project, taking advantage of modern equipment and spacious facilities to provide flexibility to manage your project. Mobil Steel provides ample set-up capacity and a flexible schedule to deliver quality fabrication for your project on time. 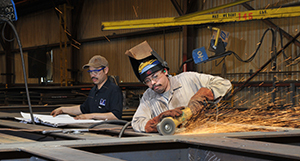 Since 1969, Mobil Steel has produced quality steel fabrication that meets our customer’s needs and schedule. 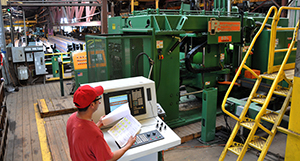 The heart of Mobil Steel’s production line features Peddinghaus machines, including a Peddinghaus 9 Spindle drill that provides productive, accurate multi-spindle drilling and part marking on structural profiles. Our Peddinghaus Beam Coper provides a multi-torch answer for quality, precision cutting and our Peddinghaus Mitre Saw provides clean cuts time-after-time. 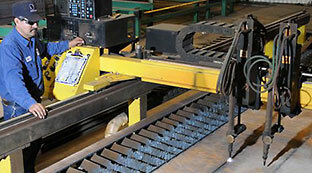 Our ESAB Computer Controlled Plate Burner is capable of 6-inch thick cut to essentially any shape and an Automated Plate Fabrication process enables production of plate detail for any shape or hole pattern. Our Peddinghaus Plate Angle Master process delivers accurate production of clips and other items. Additionally, Mobil Steel features Bertsch Angle and Channel Rolling Capability for platforms, ladders, handrails, and other light fabrication. Our Ercoline 1″-2″ Pipe Bender minimizes welded construction and produces unblemished curves. We also feature an IKEDA Radial Arm Drill. Mobil Steel has invested in respected brand name equipment to enhance our production as we strive to provide our customers quality steel fabrication and on-time delivery. Our experienced and skilled workforce combined with modern brand name equipment, like the Peddinghaus drills, and our spacious facilities demonstrates our pursuit of excellence in job performance. We strive to be the best steel fabricator in Houston so that we can deliver quality steel fabrication on projects throughout the world.Let us partner with you; you will value Mobil Steel’s experience!